By corkscrew, March 20 in Show Off!! Second time trying the Mexican round braid. Man that takes a lot of lace! 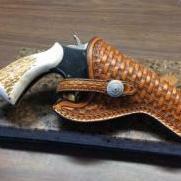 Sheath looks great. Yes it does takes a lot of lace for the Mexican round braid, but it sure looks nice. Great braiding and that basket weave stamping is very very clean. Outstanding. I'm not used to seeing green and yellow designs so this one really pops out. Really nice work. BUT: house rules, let's see the knife outside the sheath too! Getting such a good match to the color of the basketweave and the handle, on an otherwise black sheath is fantastic! Wow, that braid looks difficult - it must be tough to get it to look as even and consistent. Great job! 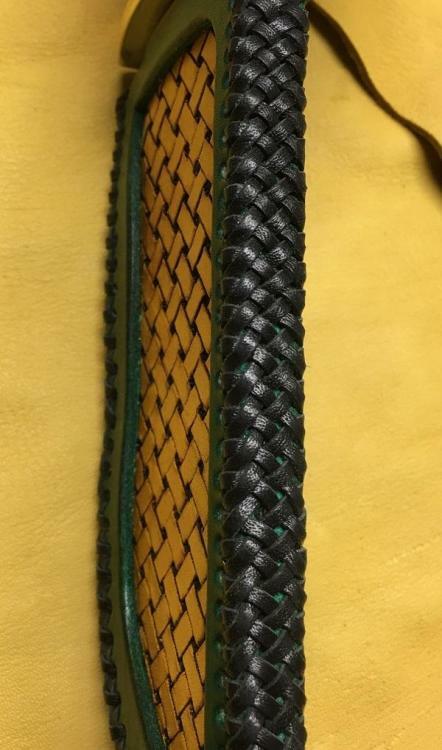 I keep coming back and looking at this sheath. Once again it is a fantastic job. What kind of dye did you use?